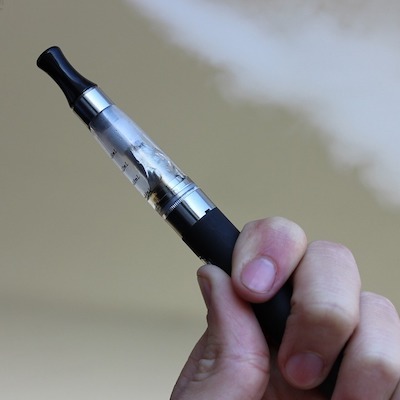 A randomized, controlled trial found that e-cigarettes may be more successful at assisting with smoking cessation than nicotine replacement products. However, questions remain about the safety of e-cigarettes, as they have not been evaluated by the US Food and Drug Administration (FDA). In this UK-based study, smokers who were interested in quitting were randomly assigned to either nicotine replacement products—provided for free for 3 months—or an e-cigarette starter pack. Both groups also received standard weekly behavioral support for a minimum of 4 weeks. At 1 year after beginning the study, 18.0% of participants in the e-cigarette group were abstinent, compared to 9.9% of those in the nicotine-replacement group (relative risk, 1.83; 95% confidence interval [CI], 1.30 to 2.58; P <.001). This result was “particularly noteworthy given that nicotine replacement was used under expert guidance, with access to the full range of nicotine-replacement products and with 88.1% of participants using combination treatments,” wrote the study authors led by Peter Hajek, PhD, Queen Mary University of London. The study randomized a total of 886 participants to either the e-cigarette (n = 439) or nicotine-replacement (n = 447) groups. Of these, 78.8% completed the 52-week follow-up. Participants had a median age of 41 years (interquartile range [IQR] 33-52) and smoked a median of 15 cigarettes per day (IQR 10-20). Among participants who did not achieve full abstinence, ≥50% reduction in smoking was validated by carbon monoxide levels. In the e-cigarette group, 12.8% achieved ≥50% validated reduction, compared to 7.4% of those in the nicotine replacement group (relative risk, 1.75; 95% CI, 1.12 to 2.72). These results must be interpreted with the knowledge that nicotine-replacement products approved by the FDA have known and accepted safety profiles, while e-cigarettes have not been reviewed for safety or efficacy by the FDA, wrote Belinda Borrelli, PhD, and George T. O’Connor, MD, in an editorial accompanying the study. The study also reported that among participants who were abstinent at 1 year, those assigned to e-cigarettes were more likely than those assigned to nicotine-replacement products to still be using their assigned products at 52 weeks (80% vs 9%, respectively). There were 27 serious adverse events in the e-cigarette group and 22 in the nicotine-replacement group, though none were classified as related to the studied products. Nausea was reported more frequently in the nicotine-replacement group than in the e-cigarette group (37.9% versus 31.3%; relative risk, 0.83; 95% CI, 0.69 to 0.99). The reverse was true for reports of throat or mouth irritation, which occurred more frequently in the e-cigarette group than nicotine-replacement group (65.3% versus 51.2%; relative risk, 1.27; 95% CI, 1.13 to 1.43). The study reported little difference between the e-cigarette group and nicotine-replacement group in rates of severe nausea (6.6% versus 6.5%, respectively) or severe throat or mouth irritation (5.9% versus 3.9%, respectively). “Trial limitations include a lack of objective and validated measures of adherence and the possibility that smoking-cessation counselors who were aware of the treatment assignments may have influenced patient expectations,” wrote Borrelli and O’Connor. Study authors also acknowledged that the lack of blinding could have affected the participants’ perceptions of each product. However, they tried to mitigate that effect by screening for participants without strong preferences for either type of product. The study, “A Randomized Trial of E-Cigarettes versus Nicotine-Replacement Therapy,” and editorial, “E-Cigarettes to Assist with Smoking Cessation,” were published in the New England Journal of Medicine.